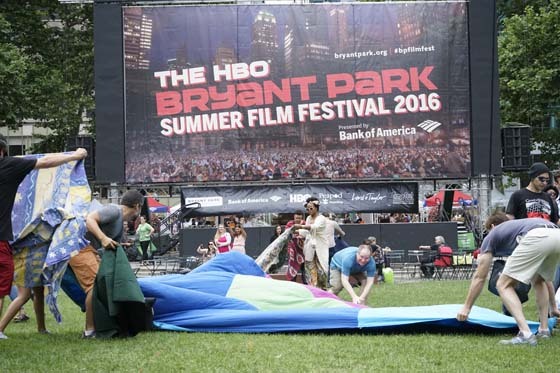 It's a buyer's market for seating at the HBO Bryant Park Summer Film Festival. Every location has some great perks tied in with its respective association to other park amenities and locales. We've gathered what we think are some of the best spots to find yourself in while enjoying a night at the film fest. Front of the Lawn - Hear us out, because this might sound like an unpopular opinion, but we're talking about the very front of the lawn. 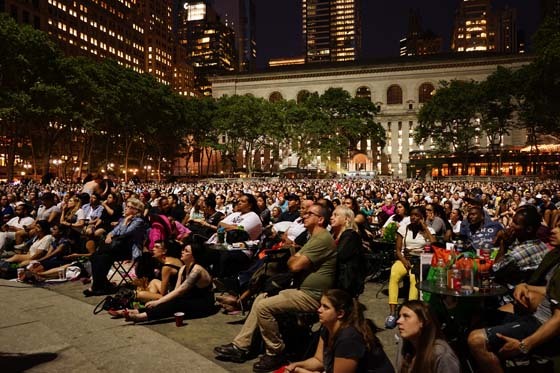 For many attendees, #bpfilmfest is a social experience, an excuse to get together with a group of friends and enjoy a night outdoors and experience one of those "Only in New York" rituals. The key here is proximity. By locating yourself towards the front, you're guaranteeing yourself proximity to one of the best parts of film fest: the food. Inherently though, guests oriented towards the front also have proximity to the speakers. If you're a vocal movie-goer (we know you exist) the sound is plentiful and allows you to have light but respectful conversation and commentary without fear of disrupting the viewing experience of your neighbors. Whether it's the bistro chairs on the gravel or blankets at the very edge, our front seats aren't pariahs like standard movie theaters. Side Gravel Chairs - The chairs on the gravel adjacent to the lawn are the box seats of film fest. Not only do you get the ultimate comfort of an actual seat, but you can pair these with our bistro-tables for an upgraded picnic experience. We've seen guests bring table clothes and whole bone china tea sets to adorn their stations. If you're tall like this blog writer, you can escape the shame of blocking someone else's view with a seat abutting the lawn balustrades. There's also the advantage of multilateral escape movement either back towards the bathroom and front to the food. Pro-tip: bring a seat cushion or fashion one out of blankets, so our bistro chairs are still comfortable when the final credits roll. Room to stretch your legs, easy access out, the sides have a lot to offer. 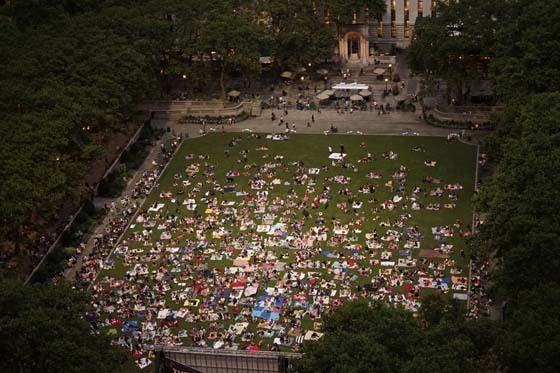 Back of the Lawn - While some of our most popular movie nights see the lawn entirely covered in a sea of blankets, oftentimes, the rear of the lawn is far less dense than other parts. This however doesn't mean it's any less attractive; in fact, some of our lawn rushers prefer to swoop in from behind to stake out this uncharted territory. The back is where the real party is at! It's best for accommodating larger groups looking to sprawl out with many blankets and those who want to lay out with someone special. For those who have early evening obligations and can't make it when the lawn opens to stake out a spot, guests can still find a coveted lawn spot towards the back up until sunset when the show starts. You've also got the wonderful smell from the Lord & Taylor Rose Garden wafting in as well as proximity to our award winning bathrooms. You can see the distribution of blankets during our July 4th showing of Top Gun. Middle Center - Our list wouldn't be complete without the most obvious choice of all. The coveted Middle Center spots are the first choice for lawn rushers for good reason: they're the center of the universe. If you manage to stake out one of these spots, you can expect the most ergonomic neck-angle for viewing as well as the camaraderie that abounds in events of this size. If it's one of these spots you covet, be prepared for the long haul. Right when the lawn opens at 5pm, lawn rushers jolt to claim these prime seats and must wait hours until sunset to see a return on their investment. The most crafty among them plan their nights around this and bring picnics, snacks, and games to kill the time. You have to do this once to get the full #bpfilmfest experience. Be prepared to wait if you want one of these spots. 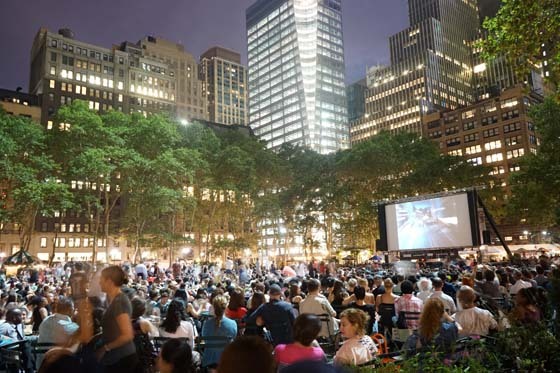 And while we can't attest to the practicality of this one, we've heard reports of some movie-goers hunkering down with a spot on the rooftop garden of the Bryant Park Grill. A veritable panopticon, in theory, the roof guarantees a vantage not only of the screen, but people watching of the crowd itself, all while relaxing in the serene garden setting with table service. If you try this let us know and be sure to tip your server well! Regardless of where you sit, there's always a good time to be had at Film Fest. On-screen captioning and our robust speaker system ensure optimal enjoyment all around. See you there!